Known for his legendary shots of rappers Tupac Shakur, The Notorious B.I.G., and Method Man, Chi reflects on sharing Heineken and rubbing elbows with some of hip-hop's biggest stars. If you’re a hip-hop fan, chances are you’ve seen a Chi Modu photograph. Hell, if we’re being real, you’ve probably come across a picture shot by the former Source Photography Director, even if you don’t like rap. 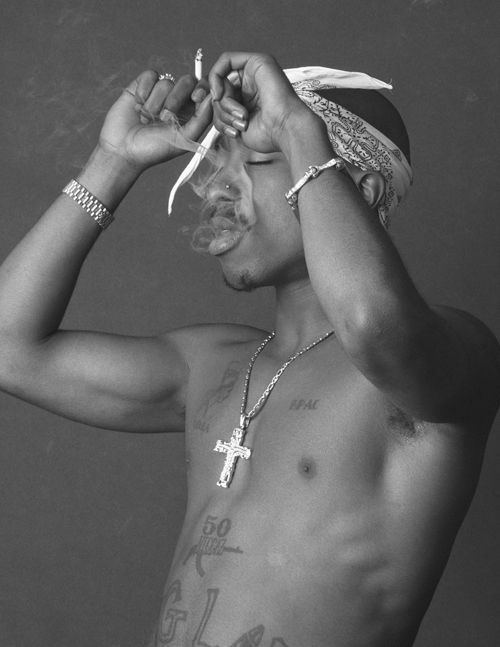 That’s simply how ubiquitous his iconic photos of Tupac Shakur and The Notorious B.I.G. have become. That type of legendary status is worthy of a deep-dive, which is why we asked Chi’s to tell the stories behind his most famous food- and drink-related pictures of rappers. While our conversation touched upon his staged portraits—like his famous fast food-themed Bad Boy advertisement—we spoke mainly about the candid shots he took of emcees like Method Man and Nate Dogg, which provide a more intimate look into their lives. From breaking down a memorable day tailing Method Man around Staten Island, to explaining how Tupac solidified Heineken as a preferred hip-hop beer, let Chi pull back the curtain on eight of his most memorable photos. Chi says: "That day I was actually photographing a Source magazine cover we did on “Death Row," and after the shoot the guys were all taking a break in the car. Regarding the beer, it's funny because you don’t really see Miller Genuine Draft much these days. There was a point where there was a big push for them in the 'hood, right around the same time that guys like Method Man were trying to make St. Ides a thing (Miller even labeled it MGD after the fact, I'm sure, to make it sound more hip-hop). The cool thing about that photo is that it wasn't staged. I think the most powerful photography captures the true, authentic moments of any situation—just like that picture. The value of it actually grew over time. The day I took the picture—that's cool in and of itself. But it becomes a part of the historical record later on. Nate hasn't been with us for a while, so it makes a scene like that all the more important." Chi says: "Remember how Jon Stewart had a show before he became Jon Stewart on The Daily Show? Well, this was backstage for that program. Most people nowadays didn't realize he had a show before that. I remember the day I shot this picture was the day Biggie performed. This moment showcases him and Puffy backstage, just killing time. In the end, I'm glad I took some of those pictures, even if they weren't for anything specific. Why not? I have my portraits of these people, but I think the fans want to see the other more intimate stuff like this. They end up telling more of a story than was presented at the time. As for their choice of fruit, I think they randomly just had it. I don't know the details behind it [laughs]." 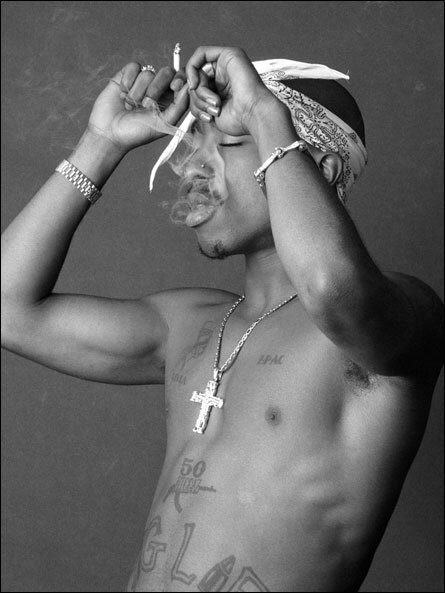 Chi says: "This was the same day that I took that picture of him smoking while he’s tying his bandana. But this shot was an outtake in a way. I did it in between the shoot. When I was taking a break or putting film in my camera, I’d grab my 5mm and take some additional photographs. Being a Heineken drinker, I’ll always have my beer at the set. It's one of life's common things: offering to share a beer with someone. The crazy thing about it is that I'm having a beer with a world-famous superstar. So once the shot makes it to the general public, it becomes iconic. To be honest, I don’t know if I influenced Tupac to drink Heineken. He never said no to it. After that shoot, we went back to his house and hung out in the backyard. At that point we were drinking Moet from the bottle (not the glass). I don’t really drink champagne, but we were celebrating." Chi says: "This picture shows typical black neighborhood stuff, like the grill out on the street. I don’t think it was a cook out, maybe just a corner food spot where they make the chicken so you can buy it. But I’m under the impression that they weren’t there cooking for themselves. If you pulled out a chair you could join them, and enjoy people sitting around telling stories. It’s an American tradition, a universal photograph." Chi says: "This was a quintessential shot from the 'hood. Everyone knows it. It's a universal symbol: drinking a 40 on a hot day on the block while rocking some shorts. You don’t see this scene as much, but it used to be incredibly common." Chi says: "This is a shot I got of [DJ] Premier and Guru at the Time Cafe. At that time, they were both moving into the jazz space heavily. One of the spots in the city where they'd grab their records was Tower Records off Lafayette. Time Cafe was around the corner. You could almost argue that it was the hip-hop restaurant, considering how many people stopped in there." Chi says: "If you look at the caption I added to my Instagram post of this picture, I put "shrimp fried rice with extra shrimp." If you've ever been to a 'hood Chinese restaurant, you'll know that was always a [go-to] order. As a photographer, I try to get at the heart of who my subject is—so I want to see your neighborhood, where you eat, where you hang out, your girlfriend, your family. I want to see who you are, you know? Here you have a classic Chinese restaurant with the bulletproof windows. In this photo, my assumption is Meth's simply inside his neighborhood spot [Ed. note: Our best guess is it could be China Garden in Staten Island's Clifton neighborhood, which is near where Meth grew up]. Since my style is fly-on-the-wall, I wanted to dive into this Chinese restaurant with Meth while he met some friends. I just try to mimic his movements.